The acephate pesticide is considered a general use insecticide and is used on many crops inside and outside the U.S. Classified as a General Use Pesticide (GUP), it is unlikely to harm the environment as long as you follow the directions on the product label. As an organophosphate foliar spray or granular insecticide of moderate persistence, it ensures residual systemic activity of about 10-15 days at the recommended use rate. It is used for control of a wide range of biting and sucking insects, especially aphids, including resistant species, in fruit, vegetables (e.g. potatoes and sugar beets), vine, and hop cultivation and in horticulture (e.g. on roses and chrysanthemums grown outdoors). It also controls leaf miners, lepidopterous larvae, sawflies and thrips in the previously stated crops as well as turf, mint and forestry. Acephate is most effective on turf, tree, and ornamental pests. 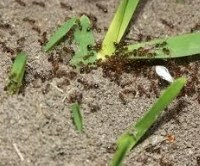 Also control ants (including imported fire ants), cockroaches, crickets, firebrats earwigs, pillbugs, sowbugs, pantry pests, and wasps. Organophosphate insecticides, like acephate pesticide, work by interrupting the electrochemical processes that nerves use to communicate with muscles and with other nerves. This causes a build-up in the chemical acetylocholine. Eventually, the build-up of acetylocholine in the muscles causes over-stimulation, resulting in paralysis and death. Considered non-phytotoxic on many crop plants, acephate and its primary metabolite, methamidophos, are toxic to Heliothis spp. that are considered resistant to other organophosphate insecticides.